What drives Gregory Thielker and Alexandra Pacula? 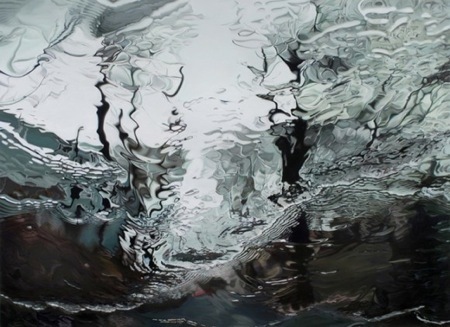 Their styles of oil painting are shaped by photography and filtered through car windows. Both pay homage to an instrument praised for transparently rendering reality—yet their paintings withhold the straightforward picture you would expect. They like to place obstacles between the observer and observed. 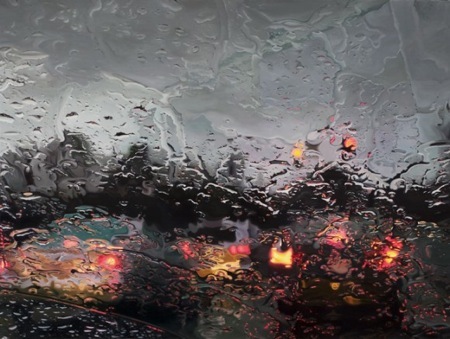 Thielker chooses rain, bringing photorealistic detail to drenched windshields, an everyday scenario where unmediated vision might actually save your life. Pacula, by contrast, chooses a style of blurring that mimics the woozy smears of long-exposed film. These artists tilt representation toward abstraction, one extracting vitality from stillness and silence, the other turning the commotion of real life into the repose of pure color. 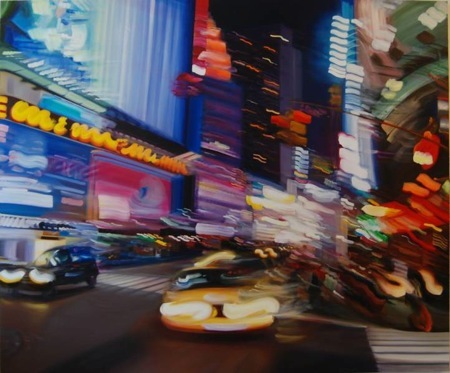 Gregory Thielker shows us a world lighted less by the sun than by the red glare of brake lights and traffic lights. It’s an overcast, halted place. 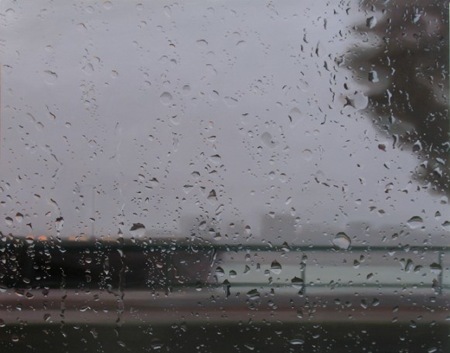 Here everything—which is to say, nothing—seems to occur under rain clouds or the cover of nightfall. If we’re not waiting on the road, we’re in parking lots. This inert realm outside the vehicle is refracted through patterns of rainwater: waxy droplets, lattices, and sheets of rippling liquid. 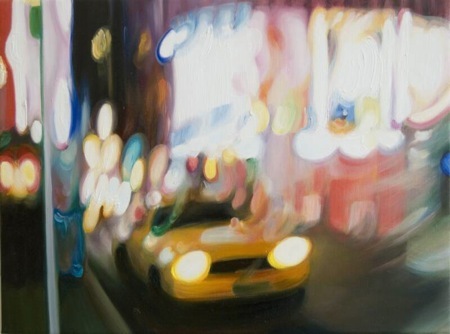 Thielker’s lyrically fractured vision lends a sense of mystery and activity, a fugitive spark of life, to the quiet routine of a country locked in its own cars. Alexandra Pacula gazes outward from a quintessentially New York point of view: a taxicab window. She presents a sunless setting, too, though in her images we find more headlights, neon signage, and peeks into brightly lit interiors. Lights, in other words, that approach us and invite us in. Little can be seen clearly because the passage of time blurs and bends the scenes like memories. Clarity doesn’t attract Pacula. She prefers the delights of the deceiving mind—and camera. 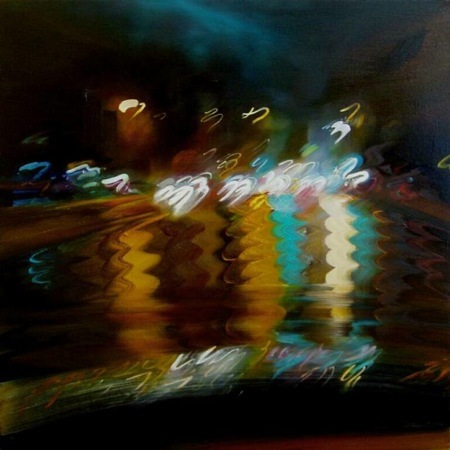 Watching the glow of storefronts and passing cars and street lamps melt into twitchy trails of color, after all, one thinks of long-exposure photographs and their disloyalty to reality. Her paintings likewise rebel. They side against the frenzy and fluorescent vertigo of the city at night, rebuilding blandly busy moments as absolute visual spaces into which the beholder can escape.